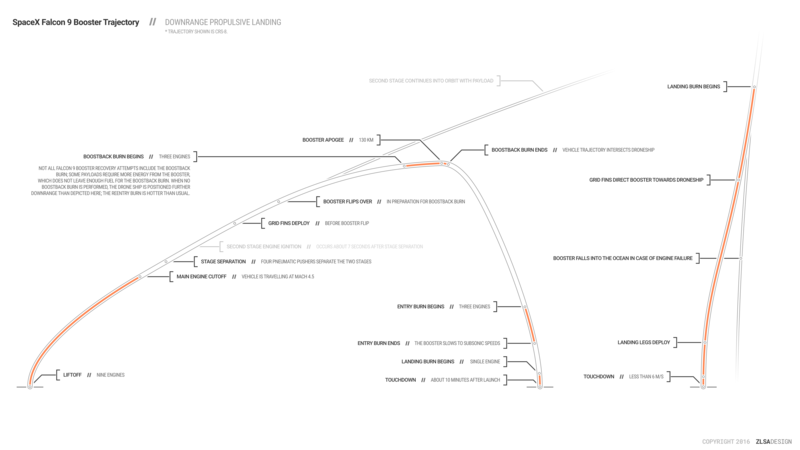 This is the approximate trajectory of the SpaceX Falcon 9 booster during a downrange propulsive landing (i.e. ocean landing) on the ASDS. Note that this profile includes a boostback burn; this profile was used during the launch of CRS-8, among others. It’s not used with heavy payloads, such as some of the larger GTO missions; instead, the booster does not perform a boostback burn and ends up much farther downrange, requiring the ASDS to position itself much farther from shore. The approximate trajectory of a Falcon 9 landing without a boostback burn can be seen here. The Falcon 9 launches, as normal. After stage separation, the second stage engine ignites to continue its trip into orbit. The booster stage flips around using its RCS thrusters and deploys its grid fins. The Falcon 9 booster performs a short boostback burn. Unlike the profile of RTLS missions, the boostback burn only shortens the downrange distance; the IIP is still in the ocean. At about 70km in altitude, the booster ignites three of its nine engines for its entry burn. The entry burn ends at about 40km. The entry burn slows down the booster to prevent aerodynamic damage as it begins to pass through the atmosphere. The grid fins constantly control the trajectory of the booster, directing it towards the ASDS. At about 8km in altitude, the landing burn begins. On most missions, this is done with only the center engine; however, on some missions, three engines are used instead. Three-engine landing burns use less fuel but are also more risky; however, they allow the booster to provide more velocity to the payload than a single-engine landing burn. Seconds before touchdown, the four landing legs deploy. The booster touches down on the ASDS; the RCS thrusters at the top of the booster help stabilize the vehicle. Soon afterwards, unused LOx is vented; the RP-1 (kerosene) propellant remains in the tank. The trajectory of the SpaceX Falcon 9 booster in this infographic is based on Flight Club’s recreation of the CRS-8 launch trajectory. Check Flight Club out at their website and on twitter!